Ribbon: 2.25", 1.5", 5/8". 3/8"
Fall Head over Leaves with this great Orange Fall Leaf Bow. This is a pinwheel style layered bow with orange, white and red leaves. The bottom is a 2.25" orange grosgrain bow that is topped with 4 loops in each corner of an orange with pink moon stitch edging. There are 7 inch strips of ribbons that vary in the top pinwheel: 3/8 inch orange shimmering, 5/8 inch satin orange with white leaves, 1.5 inch shimmering assorted leaves and orange grosgrain. 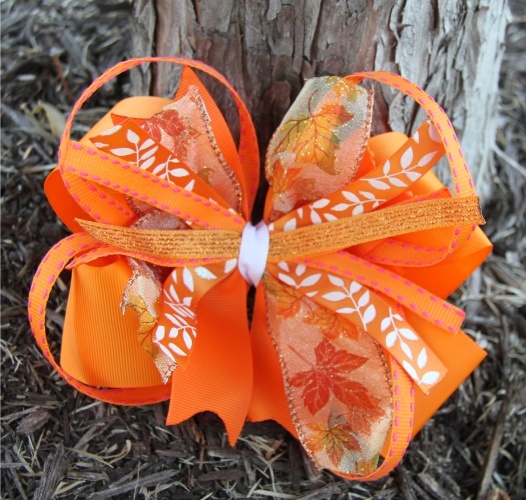 This Fall bow will match any Fall outfit and be a perfect touch for Thanksgiving Day.